Here are some great photo tips to help you with photographing your next model, as well as some basic guidelines for submitting photos and articles to the magazine. 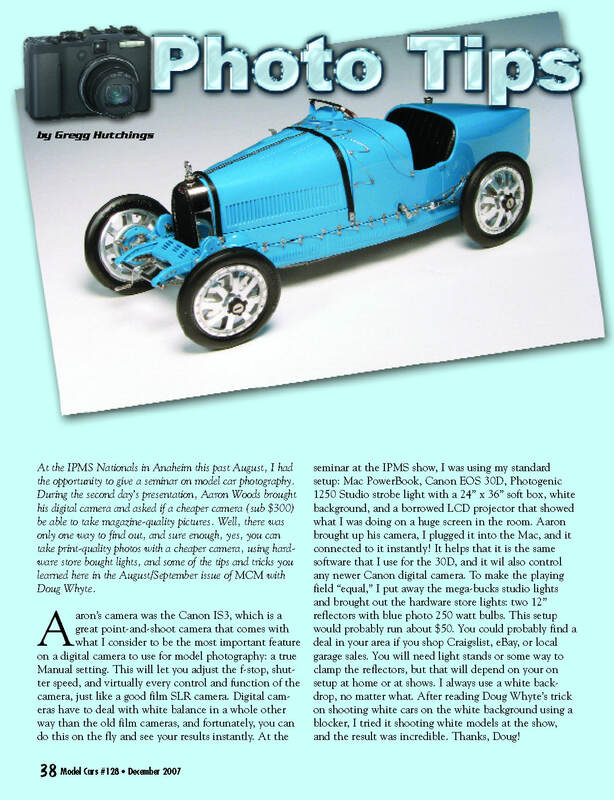 I get asked a lot for tips, recommendations, and basic guidelines on photographing model cars, and how to submit them to Model Cars Magazine. I will try to give you a summary of some things that will hopefully help you capture picture-perfect images every time. With the availability of reasonably priced digital cameras these days, I will be focusing on them more than traditional film cameras. Prints and slides are still acceptable means of supplying photographs of your models; the basic principals of good picture taking will apply to digital and film cameras. The secret to any good photo, be it digital or film, is proper lighting. I use a professional studio Photogenic 1250 monolight with a Photoflex 36” soft box. This is really the way to go if you want to get serious about taking pictures, although these can get quite pricey. 1200-watt monolights can run over $500, just for the light! You will need a soft box, speed ring (adapter for the light/soft box), and either a PC sync cord or an adapter from your flash mount to trigger the strobe. Most if not all professional studio lights will let you fire the light using a slave, which is triggered by the flash on your camera. A full setup for a monolight could run a thousand dollars easily. Check out eBay if you are really in a pinch, but I would suggest your local photo store as the place to get a pro light setup. They offer great service, will answer all of your questions, and you know that if you have a problem with the unit, they will be there, right around the corner, not a thousand miles away by air freight. You can get decent results with standard photo light bulbs, simple reflectors, and standard camera-flash units. Photo light bulbs are blue in color and are available in various wattages like 250 and 500. Be careful, though. These bulbs get very hot, very quickly. Do not leave the bulbs on very long at all, nor should any models be left near the photo bulbs, they could very well melt. If you don’t have access to photo bulbs, or are a little leery of using them, you can always try to use color corrected film for tungsten lights. You can also try to use filters that filter out the orange colorcast by incandescent lights. In my opinion, this is not the best way to go about it. All you are doing is trying to adjust or correct the colorcast by standard lighting. The best way is to use lighting that is made and used by professional photographers. For backgrounds, I prefer to have all models shot on a plain white semi-gloss paper. I have had really good results using standard poster boards from the local department/drug stores. Plus, if the models are shot on a plain white background, it makes digital color correcting the images a lot easier, knowing that the models are on white paper. To put it in simple terms, when using the photo manipulation software, Photoshop®, I can set the levels of the image by selecting the backdrop as the white base point with the tools in the level adjustment for that and every image, getting consistant colors through all the models that were shot. One tool that I can’t emphasize enough if you are going to be using a film camera is a light meter. Light meters are invaluable tools for any type of serious photographing. The light meters that are in good SLR 35mm cameras do an okay job of measuring the available light and setting the automatic exposure for your camera, but if you want to really get serious and dial in your lighting and exposure, then a light meter is a must-have tool. They run about $150 to $400, and you could probably find used ones on eBay. There are a lot of photographers who will tell you that you have to bracket your shots. I firmly believe that if you use a light meter, take accurate meter readings, and set your camera accordingly, you don’t need to bracket shots. Bracketing means that you move the exposure up and down a couple of stops on the camera above and below what the light meter calls for. The higher f-stop is also recommended in order to get a bigger and longer depth of field. This means that if you set the lens at f:22 or f:32, you will have more of the front and rear of the model in focus, as opposed to setting it at say f:11 or lower, which will result in only the front or rear of the model in focus. A higher f-stop will necessitate more lighting to compensate for the smaller opening of the lens. The lens I have, a Sigma macro 50mm, is capable of going to an f:45 aperture setting, which really gives me a fantastic focusing range. Digital cameras have become more affordable lately and you can get some pretty good deals not only through local camera and photo stores, but some department stores and computer resellers are offering 3-, 4-, and even 5-mega pixel digital cameras at sometimes less than $300! My first digital camera was a whopping 1.2-mega pixels and it cost over $1,200. Now, that same camera can be had for under a hundred bucks! But that is the way technology is. If you wait long enough, not only will your favorite electronic toys drop in price, sometimes it seems like the day after you bought it, but it will also be obsolete. Using a digital camera for the model car photographer is a lot easier than a standard 35mm film camera. You can see the results of your lighting, position of model, even fingerprints and dust immediately. Most of the cameras on the market have the ability to adjust for different types of lighting. There are usually icons for daylight, a moon for night shots, a lightning bolt for using a flash, a flower for macro, and other icons that are better explained in the user manuals. One thing you want to experiment with is the white balance of the camera. You will notice that when you shoot your test model on the white background, sometimes the shot comes out really blue. There is usually a white balance adjustment that you can change to see if you can get as true of a white background as possible. You can also bump the exposure compensation settings up or down to try and get that white backdrop perfect. On some cameras, you can set the film speed (ASA), and if you can, try to set this at 100, or lower if possible. Using a tripod will help avoid any blurry shots, and it is a good thing to use when shooting models. If you haven’t picked up a digital camera yet, I would suggest that you get one that is at least 4-mega pixels, or higher. The higher the better, and if you can, get the highest mega pixel camera that you can afford. My favorite of course is the Canon EOS line, but I have really good experiences with almost all of the Olympus line of digital cameras. The 4000 and 5000 series of cameras are almost fully adjustable, and they take really good close up shots. Some of the Nikon digital cameras can get as close as 3/4” to the subject. Now that is what I call macro! If you are choosing a digital camera to use with studio lights, make sure that there is an external flash connection on the camera. Most of the Canon high-end cameras have a PC sync cord connection, and there is also a hot shoe adapter available on some other cameras. Don’t be afraid to ask a lot of questions to your photo sales rep. They know a lot about digital cameras, and if it’s a good store, they will let you try out almost any one of the new cameras available. When shooting digital pictures for submission, make sure that you use the highest resolution setting on the camera, such as SHQ, which stands for Super High Quality. This will greatly reduce the amount of pictures that can be stored on your memory card, but hopefully you were able to buy either a couple of extra memory cards, or a high capacity one like the 1GB Compact Flash memory cards that I use. You can also download the digital pictures directly to your computer, and with some cameras/computer setups, you can manipulate the camera directly from the computer. This is what I use when I go to shows. I have a Mac PowerBook laptop that is connected to the Canon EOS 30D digital camera. I have the studio light set off by the PC sync cord that is connected to the camera. At shows, I use to use a Canon EOS 30D, with a Sigma 50mm macro lens, shooting at f:32, 1/125. This was a digital camera that;s capable of producing 8-mega pixel shots. More than enough for a cover shot at 300 dpi, eight and a half inches wide. Now (2012), I went to the newer Canon EOS Rebel T2i, a 14-mega pixel upgrade to the older 30D. I still use all the same Canon lenses. A friend of mine, Wayne Weber, let me use his Nikon DSLR once at a show in Atlanta, and I fell in love with the color that camera could put out. I had to no color corrections at all to any of the photos that I shot. With my Canons, I have always had to do color corrections to all final photos. I am too invested in my Canon gear to switch. But, if I ever come into some extra money, and a lot of it, I would definitely try out a whole new set of Nikon gear, with some dedicated Macro and prime lens. Digital cameras have a couple of options of saving the digital pictures on the memory cards. They be saved as JPEGs, TIFFs, or RAW digital files. JPEGs are the ones that are probably the most common to everyone. They are compressed files that can be saved in different compression settings. The lower the compression, the smaller the file size, but the greater loss of picture quality when the digital picture is opened up again. Setting the compression to the highest setting results in a larger file, but there is minimal quality lost. TIFF images sacrifice no quality loss, but the file sizes are very big. With a 6.3 mega pixel camera, the TIFF file is about 8 megs. In comparison, the same file as a JPEG would be about 600k. RAW files are the digital files straight from the camera. You need to use either the software provided with the camera to open and manipulate the image, or specialized plug-ins or the latest version of Adobe Photoshop® to open them. When you are working with the digital images to send in to Model Cars, please do not open and resave or rename the images on your computer. Doing so not only changes all the information that was originally embedded in the digital file, but your computer’s profiles are also embedded into the file. The image may look great on your monitor, but no two computer monitors are the same, and what looks good on your monitor may not necessarily look the same on my monitor. If you have to rename the file, do so by single clicking the file name and changing it that way. Do not open and resize, rename, or change the original digital files. We can read almost any type of CD or DVD if you are going to burn the images and send them in that way. Make sure that the CD burning software can format the disc to the standard ISO 9660 setting, which is the basic setting that both Macs and PCs can read. We also have file uploading capabilities online. The last thing to discuss is photo captions. Please send in photo captions, with the corresponding digital file name or number clearly in the caption, with each photo caption. Captions should be about two to four sentences long. Making the captions all about the same length really helps the layout look balanced. Photo captions, contest stories, results, sponsor lists, and awards can also be sent in on a CD or DVD, or they can be emailed to me. We can read any text or Word .doc file that you send. 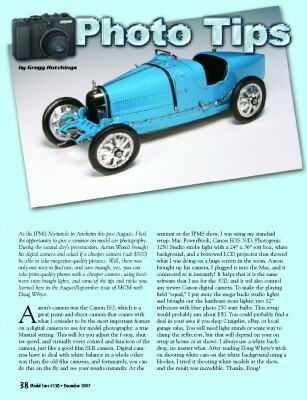 If you have any questions, don’t be afraid to drop me an email at gregg@modelcarsmag.com. I answer every e-mail I get, except of course for marriage proposals.